28 June 2010 This paper investigates the evolving relationship between St Martin-le-Grand, a distinct liberty subject to the city of Westminster and the City of London. St Martin-le-Grand claimed exemption from the jurisdiction of the City up to 1548 but by the fifteenth century, the City had become more conscious of itself as a corporate body, and less accommodating of those who, within the City claimed, exemption. Concerns focussed on the abuse of the right of sanctuary within the precinct and on fraudulent goldsmith’s work produced in St Martin-le-Grand in the form of chains, brooches, rings, cups and spoons, made of inferior metal gilded or silvered and intended to be sold as the real article. 25 October 2010 An account of the Houndsdith murders when three unarmed City of London policemen were gunned down in the street by revolutionaries who had found refuge in London from political repression in Russia, Latvia and other East European States. January 2011 A history of the Drapers’ Garden site from Roman times to the twenty first century. Of particular note is the sixteenth century ownership of the site by Thomas Cromwell, Chancellor and advisor to King Henry VIII. 27 June 2011 This paper documents the fate of the Highland Chiefs, including the Earls of Cromarty and Kilmarnock and Lord Balmarino were tried at Westminster following the battle of Culloden Moor. A detailed description of the trial of Simon Fraser, The Lord Lovat Head of the Clan Fraser, the last man to be beheaded at the Tower in included in the account. 31 October 2011 This paper reviews the social history of Queenhithe, with specific reference to prostitution along the river bank. 18 June 2012 Guildhall Art Gallery Conservators Nancy Wade and Judith Wetherall discuss the Samuel collection of paintings which have been displayed at the Mansion House since they were bequeathed to the City Corporation in 1987. Nancy discusses artists’ studios and materials, including supports and paints while Judith speaks of the frames, referring to the styles and materials used in their preparation. This paper was presented at the Mansion House. 29 October 2012 This paper looks at the founding of the three City Academies in Southwark, Islington and Hackney from first discussions in 2000 to the realisation of the project with the opening of the first Academy in Southwark in 2003. The paper includes background on the government’s plans and policies on transforming Secondary Education and how the City of London responded to this challenge. Who Killed Alderman Sir Alfred Newton? 25 February 2013 The circumstances surrounding the unexplained death from strychnine poisoning in 1921 of the former Lord Mayor of London, Sir Alfred Newton, are discussed and background on his life and civic career is given. The financial scandal around the acquisition and management of the Industrial Contract Corporation in the late 19th century is put forward as a possible motive for the poisoning of Newton although the killer has not been identified and the mystery around his death remains unsolved. 10 June 2013 Mythological origins of the Stone moving through to Roman times & later references in Stow’s Survey of London, 1603; 17th & 18th century attempts to have it removed due to persistent complaints to the City authorities about its inconvenience; the survival of the Stone despite widespread bombing in the Second World War and its removal from the ruins of the Church of St Swithin to its current location at 111 Cannon Street. 18 October 2013 13th century references to the Hanse merchants; the derivation of the word “Steelyard”; the location of foreign merchants in Dowgate Ward since the late 10th century; special privileges granted by King Henry II & King John; the strict regime observed by the Hanse merchants; trading connections of the merchants; disputes with the City authorities concerning the upkeep of Bishopsgate & other grievances caused by the preferential treatment of the Hanse merchants; the demise of the Steelyard & the sale of the site for building Cannon Street Station. 20 January 2014 The nature of the City Corporation’s current representative role with regard to the UK’s financial services industry; the reasons behind the development of this role including changes in local government in London with the abolition of the Greater London Council and the changing role of the Bank of England; the establishment of the City Research Project and the Economic Development Office with representative offices in Brussels, Beijing, Shanghai and Mumbai; the creation of “TheCityUK”; review of governance leading to the formal recognition of the City Corporation’s role in the terms of reference of the Policy and Resources Committee. 16 June 2014 Victorian attempts to develop the Flats leading to a huge demonstration requiring police intervention in 1871; leisure activities in the early 20th century; the Flats requisitioned for military purposes in the Second World War including temporary housing for bombed-out families; West Ham Corporation’s attempts to build permanent housing on the Flats defeated by legal judgement in 1947; subsequent major restoration programme undertaken by the City of London Corporation. 6 January 2015 Paper read by Sir Robert Worcester in his capacity as organiser of the 800th Anniversary Commemorations of the sealing of Magna Carta; personal reminiscences from Sir Robert; details on the 700th anniversary commemorations in 1915; links with America and the display of the 1215 document in the Rotunda of the United States Congress in 1976; details on forthcoming events to mark the anniversary during 2015. 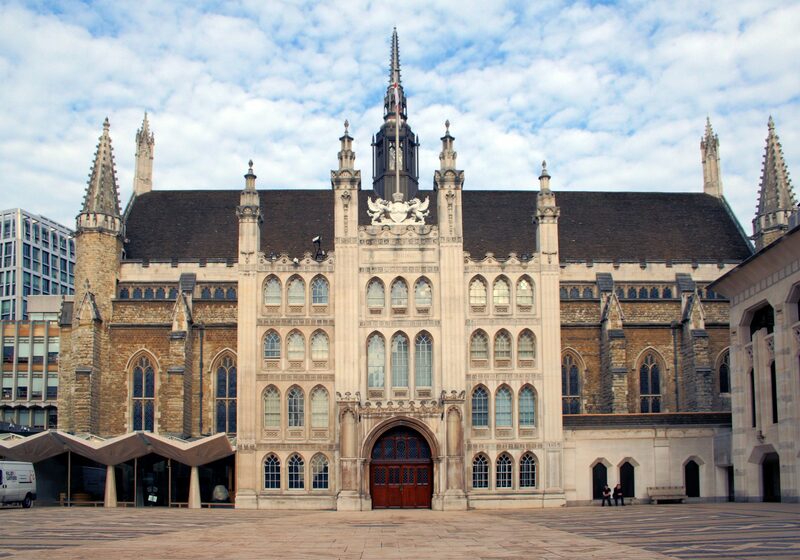 19 June 2015 Changes to the built environment of the Guildhall Complex covering the period from 1884, discussing the ‘new’ Council Chamber, the Great Hall of Guildhall, the former Art Gallery, North Office Block & West Wing offices, the construction of new Guildhall Art Gallery incorporating the remains of the Roman Amphitheatre; the Guildhall Improvement Project; changes in organisational behaviour with examples given of changes to committee meetings; changing role of Chairman of Policy Committee and that of Chief Commoner. 12 October 2015 The background to the formation of the Society including the part taken by the Policy and Parliamentary Committee to encourage young persons to become Freemen of the City of London with discussions with the Guild of Freemen; the early years of the Society from its formal establishment at the Mansion House on 7 December 1976; possible motives of the City in facilitating the establishment of the Society. 11 January 2016 London’s early water supply; the London Conduit Act of 1544 empowering the City to make use of the springs on Hampstead Heath; the1692 Act of Parliament creating the Hampstead Water Company; the creation of reservoirs; the artist John Constable painted the Heath many times with ponds appearing in several of his works including “Hampstead Heath with a Rainbow”; an account of the history of swimming in the Ponds; major incidents of flooding in the Heath, including the most serious one in 1975 with details of the effect on the Heath; the start of the “Ponds Project” which will ensure that the risk of dam collapse in the ponds is eliminated. 31 October 2016 The early life of William Beckford; the great accumulation of wealth from sugar plantations in Jamaica; his return to England and purchase of Fonthill Estate in Wiltshire in 1745; election as Member of Parliament firstly for Shaftesbuy then latterly as one of the the City of London’s four MPs; his election as Alderman, Sheriff and Lord Mayor; Beckford’s support for the colonies as an integral part of Great Britain & with William Pitt the Elder championing reform and liberty; his reluctance to serve a second term as Lord Mayor; Beckford’s support for the radical journalist and politician John Wilkes; the erection of a statue to Beckford in Guildhall being the only Lord Mayor so honoured in this way. appointment in 1782 as plenipotentiary for peace talks in Paris to end American War of Independence; later history of “Fireproof House” and of establishment of Wimbledon and Putney Commons Conservators.